History shows again and again how felines reveal the folly of men. 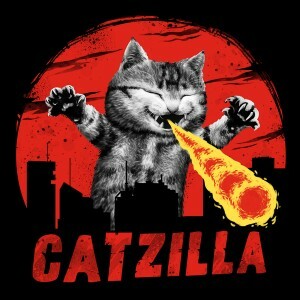 I imagine all it would take to bring down Catzilla would be a bunch of laser guns. And not even the sci-fi laser guns that actually destroy things. I mean just, like, actual, harmless lasers producing red dots on the ground and buildings. Get Catzilla to chase one of those things and you’ll lead it right into the nearest volcano. Or back into the ocean from whence it came. Wait, do Catzillas come from the ocean? Cats hate water… Well, anyway, this shirt is cute and you should wear it.